A new post for the series I am crazy about Frustrated Lewis Pairs (FLPs). If you are new to this exciting field I recommend you to read first one of my previous posts: “Frustration to a Good End”. The extraordinary reactivity of FLPs allows the stoichiometric and catalytic activation of small molecules being the most important application the heterolytic cleavage of hydrogen. The spectrum of Lewis bases used in FLP chemistry is wider compared to the Lewis acid partners. Phosphines, amines, N-heterocyclic carbenes or carbodiphosphoranes have been used, with a few exceptions, combined with boranes such as B(C6F5)3 and derivatives. Suresh Mummadi, Daniel K. Unruh Jiyang Zhao, Shuhua Li and Clemens Krempner. “Inverse” Frustrated Lewis Pairs – Activation of Dihydrogen with Organosuperbases and Moderate to Weak Lewis Acids. J. Am. Chem. Soc., 2016, 138 (10), pp 3286–3289. Gregory C. Welch, Ronan R. San Juan, Jason D. Masuda, Douglas W. Stephan. Reversible, Metal-Free Hydrogen Activation.Science, 2006, 314, 1124-1126. Stephan, Douglas W. “Frustrated Lewis pairs”: a concept for new reactivity and catalysis Organic & Biomolecular Chemistry (2008), 6(9), 1535-1539. Stephan, Douglas W.; Erker, Gerhard. Frustrated Lewis Pairs: Metal- free Hydrogen Activation and More. Angewandte Chemie, International Edition (2010), 49(1), 46-76. In parallel to the discovery of new reactions there is also a need to develop a more “green attitude”. We, synthetic chemists are often too busy focused on our target molecules to pay much attention to the “costs” of our achievements. Synthesis frequently requires the use of relatively expensive and toxic transition-metals, large amounts of solvents and additives that lead to the generation of waste along with the desired products. Going green also has an impact in economy. Industry expends important amounts of time (which means money) and money trying to remove metal catalysts and solvents. 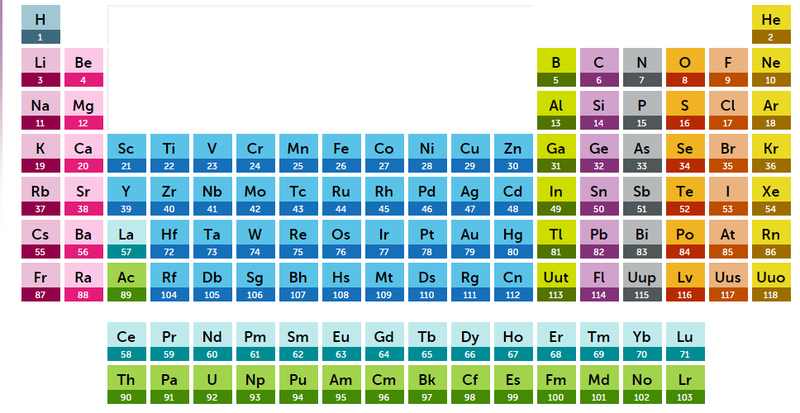 Some transition metals are toxic even at very low concentrations and that is obviously undesirable for pharma industry. Small amounts of metals can have an undesired influence in the colour or properties of an organic polymer. It is important to invest time and resources in the development of metal free methodologies. In this post I want to highlight the work published in Green Chemistry by Wei Yi and co-workers toward the metal and solvent free synthesis of benzene and pyridine derivatives. Pyridine and benzene derivatives are commonly found in organic molecules with interest in material or medicinal sciences. This new methodology describes the synthesis of benzene and pyridine derivatives from ready available ketones and amines using HOTf as catalyst. Wei Yi and co-workers remove any stochiometric or catalytic amounts of metals from the equation together with solvents.The reaction is performed in one pot with no need of other oxidants than air and features excellent yields, chemoselectivity and functional group tolerance. Nowadays thousands of “gurus” share their expertise to offer guidance in topics ranging from beauty and health to how to succeed in life. 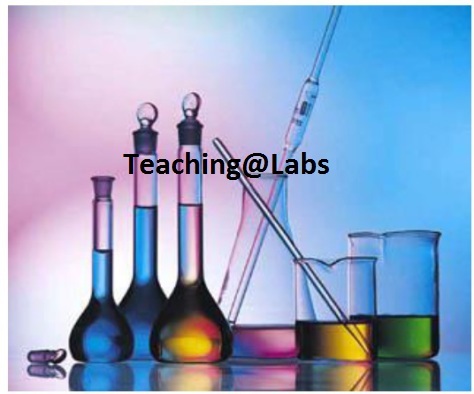 Chemistry of course is not an exception, we have our own gurus to seek for a piece of advice on many chemistry-related topics. Well, I am not a guru but still for my post today I would like to write a few lines on how I think you can improve your chances to get your synthetic methodology published in a good journal. I have also included one beautiful Yes-No flow diagram so my post is taken more seriously. 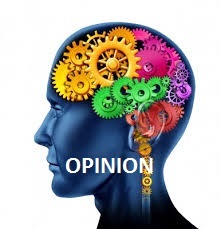 –Your synthetic methodology is new: The best scenario possible. You are the first one that solved the puzzle, but make sure the problem you are working in has relevance. And make sure that you are the first, so you did a good and meticulous literature research. Let’s say your method is good and your research is relevant, now is time to be creative. Select challenging and varied substrates and explore functional groups tolerance. If you are using a catalyst or a reagent developed by you it has to be fully characterized, an X-Ray structure can make the difference to get to the top journals. A new methodology might mean new reaction pathways or mechanisms. In my opinion at least a mechanism proposal should be always included. More and more often publications in synthetic methodology include now theoretical calculations to support mechanistic proposals. –Your methodology is not new but is way better than the others: Now is time to show your muscles. 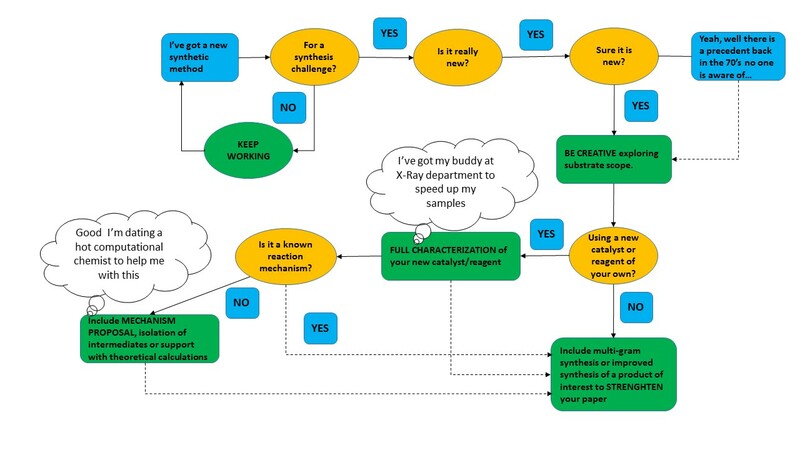 Besides being creative with substrates, having a full characterization or good mechanistic studies, now more than ever you have to include “extra toppings” to strengthen your chemistry. Stablish clear comparisons between your methodology and current methods using tables, explore recyclability or robustness of your catalyst, reagent or conditions. In other words try to highlight all your methodology’s strengths. Show off, put some efforts trying to scale-up to multi-gram levels “I synthesised 500 g at once, why? Because I can”. 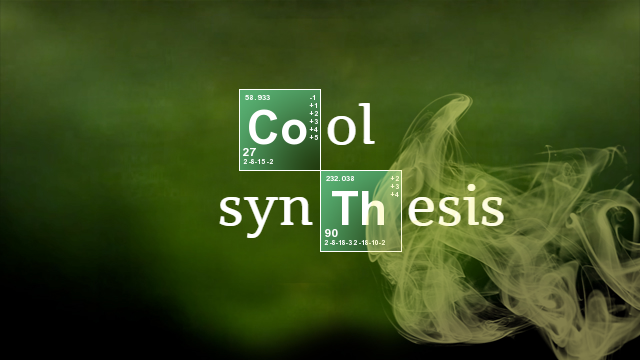 Apply your methodology to the synthesis of products of interests. To conclude this post what could be better than showing a very good example of how to get your synthetic methodology in a good journal? This great work by Snyder and co-workers (click the link) speaks for itself: Et2SBr⋅SbCl5Br: An Effective Reagent for Direct Bromonium-Induced Polyene Cyclizations (Angew.Chem.Int.Ed.2009,48, 7899 –7903). In their paper, Snyder and co-workers describe a new reagent for well known reactions of bromocyclization. They describe the synthesis of their reagent with a full characterization including an X-Ray structure and more importantly they don’t hesitate to show muscle. They compare their reagent with the existing methods at that time to clearly show their reagent is in general better than the others, they also explore the scaleability of their methodology and apply it to the synthesis of natural products. Another post for the series “This blog is obsessed with dihalogenation reactions”. In previous posts I presented some of the reactions I consider of great relevance on the subject of enantioselective dihalogenation reactions (you can take a look here and here as well :D). 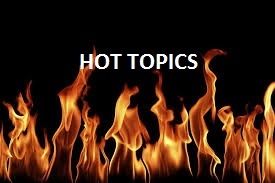 All these reactions having in common the synthesis of vicinal halides resulting from anti-addition as an inevitable consequence of the ionic nature of the addition reaction of elemental halogens and related reagents to alkenes. In other words, the challenge I’d like to highlight in this post is the difficulty of the development of straightforward methodologies for the syn-halogenation of alkenes. A great contribution to this topic is the first catalytic, syn-stereospecific dichlorination of alkenes developed by Denmark and co-workers. 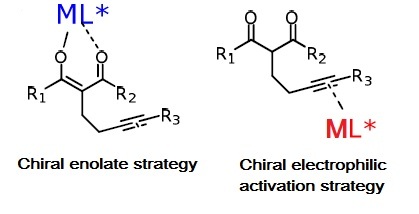 The strategy used is based on a first step of anti-addition of an in-situ generated PhSeCl3 to an alkene followed by a nucleophilic displacement with a chloride ion source leading to a syn-dichlorination product overall. The process is made catalytic by adding an oxidant to the Ph-Se-Se-Ph precatalyst. 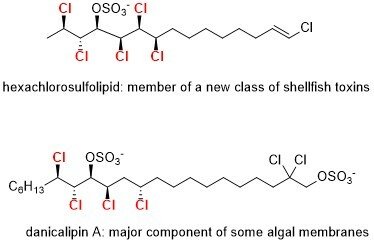 This new methodology could be very useful for the synthesis of oligo- and polychlorinated compounds such as chlorosulfolipids, a family of synthetically challenging compounds originally discovered from the membranes of freshwater algae and associated to diarrhetic shellfish poisoning. – Catalytic, stereospecific syn-dichlorination of alkenes. Alexander J. Cresswell, Stanley T.-C. Eey & Scott E. Denmark. Nature Chemistry 7, 146–152 (2015). The Conia-ene reaction was, at its origins, a thermal cyclization reaction of unsaturated carbonyl compounds usually in an exo mode. An intramolecular cousin of the Ene Reaction. This reaction usually required temperatures in excess of 300 oC limiting its utility in the synthesis of complex molecules. The potential of the Conia-ene reaction attracted the interest of many groups on the development of milder variants. We can find very encouraging contributions in the literature of Conia-ene reactions catalysed at much lower temperatures by Mo, Sn, Ti, Pd, Hg or Co, however these reactions usually required hard conditions in the presence of acid, bases, photochemical activation and were limited to the exo cyclization mode. It wasn’t until the seminal works of Toste’s group using the catalytic system AuPPh3Cl/ AgOTf that we can find a general method at room temperature that can lead to both endo and exo cyclization modes. It seems natural that the next step in the study of a reaction is an enantioselective variant. Toste and co-workers, always one step ahead, developed in 2005 the first asymmetric version of the Conia-ene reaction. The strategy: Electrophilic activation of the acetylenic moiety of b-Ketoesters with a DTBM-SEGPHOS Palladium complex as chiral promoter in the presence of the Lewis acid Yb(OTf)3. A different approach is the generation of a chiral enolate. Dixon and co-workers used this strategy in their work by combining Cu(OTf)2 with a Brønsted base. The Conia-ene reaction has proved to be a very useful synthetic tool toward the synthesis of cyclopentanoid products. Just to name one example (of many), Toste’s group application to the synthesis of (+)-Lycopladine A. –Gold(I)-Catalyzed 5-endo-dig Carbocyclization of Acetylenic Dicarbonyl Compounds. Steven T. Staben, Joshua J. Kennedy-Smith andF. Dean Toste, Angew. Chem. Int. Ed. 2004, 43, 5350 –5352. – Gold(I)-Catalyzed Conia-Ene Reaction of β-Ketoesters with Alkynes. Joshua J. Kennedy-Smith , Steven T. Staben , and F. Dean Toste, J. Am. Chem. Soc., 2004, 126, 4526–4527. –Catalytic Enantioselective Conia-Ene Reaction. Britton K. Corkey and F. Dean Toste, J. Am. Chem. Soc., 2005, 127,17168–17169. – Brønsted Base/Lewis Acid Cooperative Catalysis in the Enantioselective Conia-Ene Reaction. Ting Yang, Alessandro Ferrali, Filippo Sladojevich, Leonie Campbell and Darren J. Dixon. J. Am. Chem. Soc., 2009, 131 (26), 9140–9141. – Gold(I)-Catalyzed Cyclizations of Silyl Enol Ethers: Application to the Synthesis of (+)-Lycopladine A. Steven T. Staben, Joshua J. Kennedy-Smith, David Huang, Britton K. Corkey, Rebecca L. LaLonde andF. Dean Toste. Angew. Chem., Int. Ed., 2006,45, 5991. The development of a catalytic enantioselective reaction of bromination of alkenes can be at least as complicated as the corresponding dichlorination variant. The background reaction of bromine and other common dibrominating reagents capable of reacting rapidly with alkenes with no need of catalyst and the fact that bromonium ions can rapidly racemize in the presence of alkene do not make it any easier. 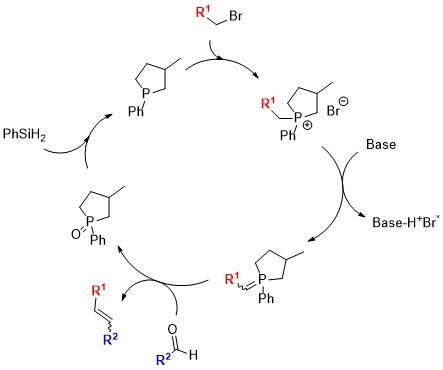 Recently in 2013 Burns and co-workers approached this challenge with a different strategy: to formally separate Br2 into electrophilic and nucleophilic components that are unreactive on their own. Diethyl dibromomalonate as the bromonium source and titanium bromide as the bromide anion source do the trick. To induce enantiocontrol a chiral TADDOL ligand is used as a chiral promoter and allylic alcohols capable to bind to the titanium metal centre are chosen as substrates. The TADDOL-type ligand used in the reaction has been found to induce good levels of enantioselectivity when used stoichiometrically and also lowering its loading to 20 mol%. Not happy with this incredible contribution Burns and co-workers have very recently published a follow up paper extending the methodoly to an enantioslective Bromochlorination version. Same strategy different actors, in this case Chlorotitanium triisopropoxide as the chloride source and N-bromosuccinimide as the bromonium source serve as a non-disproportionating equivalent to bromine monochloride and a tridentate Schiff base is used as chiral promoter. These new methodology will enable enantioselective synthesis of a wide variety of polyhalogenated natural products. As a proof of concept the paper also includes a short chemo-, regio-, and enantioselective synthesis of (+)-bromochloromyrcene and model subtrates leading to bromochlorocyclohexane motifs that can be found within several natural products including obtuso and preintricatol. Do you want to know more? Why don’t you take a look to these references? -Dennis X. Hu , Grant M. Shibuya , and Noah Z. Burns. Catalytic Enantioselective Dibromination of Allylic Alcohols. J. Am. Chem. Soc., 2013, 135, 12960–12963. – Dennis X. Hu , Frederick J. Seidl , Cyril Bucher , and Noah Z. Burns. Catalytic Chemo-, Regio-, and Enantioselective Bromochlorination of Allylic Alcohols. J. Am. Chem. Soc., 2015, 137, 3795–3798. Two-step Sequence Strategy for the Synthesis of ortho-OCF3 Anilines. The chemistry of molecules containing fluorine atoms has grown in interest and in consequence a great increase of the number of papers on synthetic strategies to introduce fluorine atoms in molecules has been observed during the last years. Fluor is known to improve the biological activity of drugs by enhancing properties such as the solubility, stability and lipophilicity of molecules. The OCF3 moiety in particular presents one of the highest lipophilicity values favouring in vivo uptake and transport in biological systems. Ngai and co-workers describe a useful procedure for the synthesis of ortho-trifluoromethoxylated anilines through a two-step sequence of O-trifluoromethylation of alkyl hydroxylamines followed by OCF3 migration. The methodology allows the formation o a wide range of ortho-OCF3 aniline derivatives with high regioselectivity and can be performed one-pot. One of the drawbacks is that the migration step requires higher temperatures than the initial trifluoromethylation making almost unavoidable the removal of solvent and further re-dissolution to achieve the whole sequence. Katarzyna N. Hojczyk, Dr. Pengju Feng, Chengbo Zhan andProf. Ming-Yu Ngai. Trifluoromethoxylation of Arenes: Synthesis of ortho-Trifluoromethoxylated Aniline Derivatives by OCF3 Migration. Angew, Chem. Int. Ed. 2014, 53, 14559-14563. This is not the first time and probably will not be the last time I post about Frustrated Lewis Pairs (FLPs). Due to the unquenched acidity and basicity of FLPs, these systems present an extraordinary reactivity to the cleavage and activation of small molecules. Unarguably, the most important application is the activation of hydrogen, FLPs are capable to heterolitically cleavage the strong bond of the molecule of dihydrogen resulting in a hydride adduct of the Lewis acid and a protonated Lewis base at room temperature. From the point of view of a synthetic chemist, the activation of hydrogen with FLPs opens the door to a new class of metal-free hydrogenation reactions. However, creativity in the area of FLPs seems to be endless as shown in the great contributions by Andrew Ashley and Gregory G. Wildgoose groups from the Imperial College of London and the University of East Anglia towards the oxidation of hydrogen. In the search for alternatives to fossil fuels, hydrogen has raised as a promising and a clean source for the production of electricity from chemical energy with the use of fuel cell technology. In the absence of a catalyst, the necessary process of oxidation of hydrogen is slow and require large overpotentials. Here is where the FLPs play their role as they considerably reduce the voltage required for the hydrogen oxidation due to the generation of hydride intermediates that are easier to oxidise to protons. Ashley, Wildgoose and co-workers were able to stoichiometrically oxidise hydrogen using one of the most basic FLP system B(C6F5)3/P(tBu)3 but unfortunately the system is not robust enough to complete more than one catalytic cycle. Some improvements were made recently replacing B(C6F5)3 for a borenium cation as a Lewis acid although the system is still lacking enough stability to properly catalyse the oxidation. 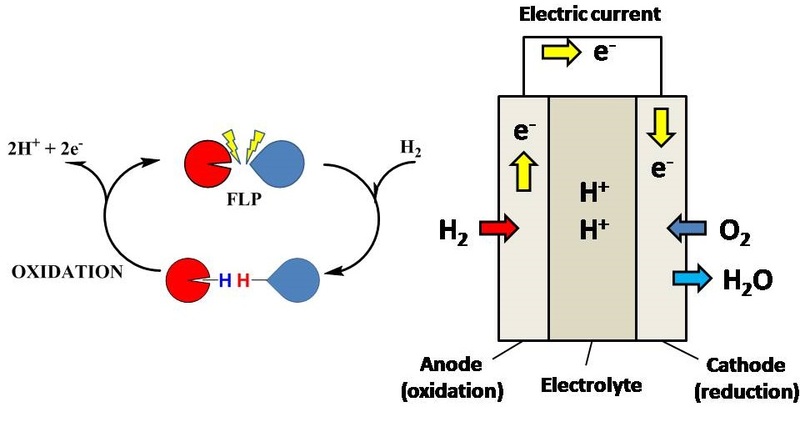 As a proof of principle, it is indeed possible to oxidise hydrogen with an electrochemical/FLP approach. FLP systems have the advantage of their inherent “tuneability” and there is still plenty of room for improvement in the way to develop a FLP based fuel technology. Elliot J. Lawrence, Vasily S. Oganesyan, David L. Hughes, Andrew E. Ashley, and Gregory G. Wildgoose. An Electrochemical Study of Frustrated Lewis Pairs: A Metal-Free Route to Hydrogen Oxidation. J. Am. Chem. Soc., 2014, 136 , 6031–6036. Elliot J. Lawrence, Thomas J. Herrington, Andrew E. Ashley, Gregory G. Wildgoose. Metal-Free Dihydrogen Oxidation by a Borenium Cation: A Combined Electrochemical/Frustrated Lewis Pair Approach. Angew. Chem. Int. Ed. 2014, 53, 9922 –9925. The Wittig reaction was discovered by Georg Wittig and co-workers in 1953 and for which Wittig was awarded the chemistry Nobel Prize in 1979. Since its discovery, the Wittig reaction has probably been the preferred choice of synthetic chemists towards the synthesis of alkenes. The formation of the alkene proceeds through the reaction of an aldehyde or ketone with a phosphonium ylide. The success of the reaction is due first to its regioselectivity, as the double bond of the alkenes is formed only between the reacting carbon of the ylide and the carbonylic partner, and second to its stereoselectivity to the formation of one of the two possible geometric isomers. The major drawback of the reaction is the generation of stoichiometric amounts of undesired triphenylphosphine oxide, a byproduct that frequently complicates the purification of the desired product. In a very smart approach to overcome the problem of generating such a big amount of phosphine oxide waste, O’Brien and co-workers from the University of Texas designed a catalytic version of the Wittig reaction. The challenges: to generate in situ the reactive ylide and to reduce the phosphine oxide without reducing the carbonyl compounds involved in the reaction. The solution: the utilization of a cyclic phosphine that is reduced by Ph2SiH2, a reducing agent mild enough to leave the carbonyl coupling partners intact. The catalytic version has proved effective with a series of aldehydes and stabilised or semi-stabilised ylides. The reaction represents an important first step to a general catalytic Wittig reaction and more research will be needed to achieve the same degree of effectiveness as the stoichiometric variant in terms of the scope of substrates and regioselectivity. Christopher J. OBrien, Jennifer L. Tellez, Zachary S. Nixon, Lauren J. Kang, Andra L. Carter, Stephen R. Kunkel, Katherine C. Przeworski, and Gregory A. Chass. Recycling the Waste: The Development of a Catalytic Wittig Reaction. Angew. Chem. Int. Ed. 2009, 48, 6836 –6839.